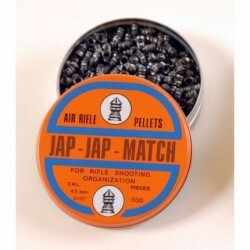 Air gun pellets There are 7 products. 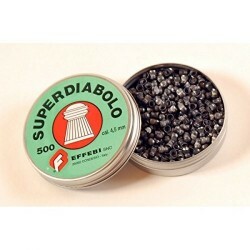 Hight-quality air-rifle pellets for training and competition, ribbed. Cal. 4.5 - gr. 0.46 Pack of 500 pieces. Perfect for sighting in target shooting. 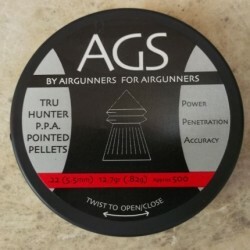 Pointed pellets with advantage of twin ring design. Improving the velocity and penetration of lower powered guns, ribbed. Cal. 4.5 - gr. 0.53 Pack of 500 pieces. 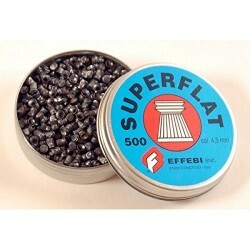 Top quality pellet of Effebi product range only suitable for strong weapons with high initial velocity. Cal. 4.5 - gr. 0.53 pack of 500 pieces. Five rings for the best air-seal, ribbed. 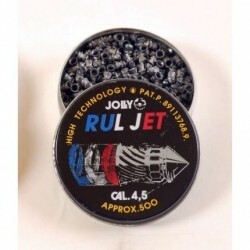 The head of Rul-Jet is made with a pre-formed cutting of the gun-barrel grooves and this helps the pellet to find right position inside the barrel. Top of the range and most universal, giving assured accuracy from all air-guns. Twin ring design provides improved air-seal, positive rifling grip and in barrel pellet stability. Ribbed. Cal. 5.5 - gr. 0.82. Pack of 500 pieces. 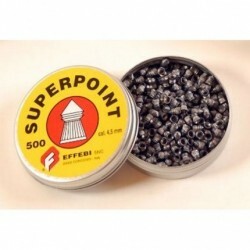 Very accurate pellet especially for field and target shooting on long distances. Pointed pellet with advantage of twin ring design. Improving the velocity and penetration of lower powered guns.